At the 50th Anniversary Member's Show of the C.B.B.A. 123 birds were benched in all sections but Junior and was a record entry. Twenty-two members attended  some 50% of the membership. The hall was decorated with 50th Anniversary balloons and banners to give a party atmosphere and members were greeted with bacon butties and tea as they booked their birds into the show. 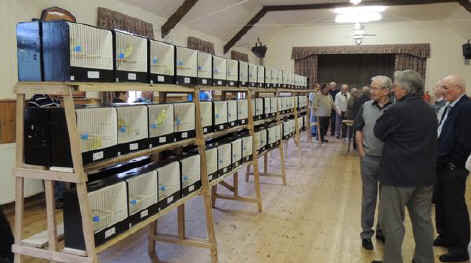 B.S President Maurice Roberts had set off from Cornwall at 4 a.m. to come and judge the birds and was glad of refreshments as he reached the Show hall. Whilst judging was taking place a panel of guest speakers consisting of Malcolm Freemantle, John Lees and Geoff Bowley entertained the members. The buffet was bought in by attendees and was a great success with even Geoff Bowley taking a turn making tea. Maurice explained why he chose the winning birds and said it was a great honor to come and judge at the 50th Anniversary Show. The A.G.M. 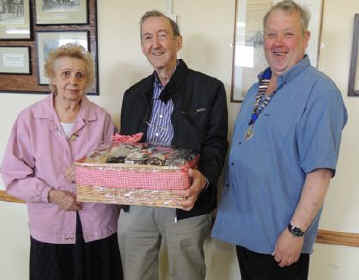 took place in the afternoon where founder members Malcolm and Pam Freemantle were presented with a hamper and the winner of the Donated Clearwings was Ian Hewitt. 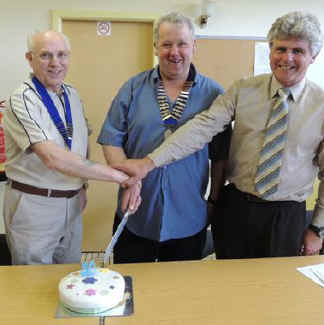 Chairman Bill Gibson, President Dave Guppy and Maurice Roberts cut the 50th Anniversary cake while Secretaries Bill & Maggie Walker agreed that this was a great event and exceeded all expectations.